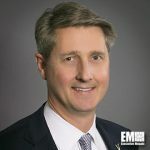 David Hathaway, formerly vice president, partner and head of defense and intelligence industry team at IBM’s (NYSE: IBM) global business services unit, has joined Vectrus (NYSE: VEC) as senior VP for information technology and network communication services, GovConWire has learned. Hathaway oversees the development and implementation of network communications and IT strategies in support of customers’ missions in his new role at Vectrus. He held senior leadership positions at IBM Global Business Services such as VP and partner for public sector application development and innovation and partner for the U.S. Air Force account. The 15-year IBM vet also worked at the technology firm’s Canadian arm as VP and partner for public sector for more than two years. Hathaway previously served as a consultant at PwC from 1995 to 2002 and prior to that, he served in the Air Force as a communications-computer systems officer for seven years.